The weekend arrived! I was down (or up) to work in Edinburgh for a HSBC Lets Ride event and worked out I had roughly 24 hours in the city, from rocking up in the van to hitting the open highway, racing for the border. Alarm blaring out at 4.30AM, Alt-J’s Breezeblocks, I was rubbing the sleep from my eyes and questioning donning kit. The air was crisp, the sky blue and temperature mild, occasionally chilly, as wind whipped across the Firth of Forth. Stood bleary eyed, Fenix 3 hunting for GPS signal, muscles confused at a second early start. 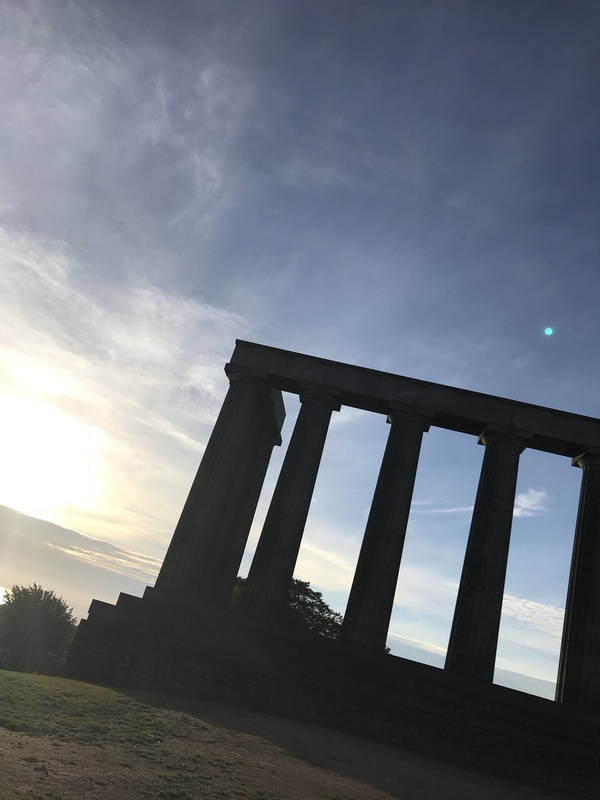 Utilising google maps and keeping Arthur’s Seat in view, I made my way through the empty wide streets of Edinburgh, my footsteps covered by the voice of Chris Hall on his Downtime Podcast. Entering the city, running from my hotel in Leith, smooth tarmac gave way to cobblestones, suburban dwellings to shops. Light in step, the city was asleep, cars with engines on few and far between, cats and wildlife the only visible signs an apocalypse hadn’t ravaged the streets in my slumber. In 2017, myself and Lisa had travelled up to watch the Great Edinburgh XC, standing at the foot of Arthur’s Seat. I had wanted to run to the top, what trail runner wouldn’t?! Entering Holyrood Park, the zig zags were shut through rockfall, so the main path was my route, as I pushed on. People, at 5AM were already at the top taking photos, as groups with duvets worn like capes, made their way down, having watched the sun rise. The man made path soon gave way to polished rock, which caked the summit. Thankfully it was a dry morning. Having gained an eye fall and yes, it was surprisingly chilly, despite it’s diminutive stature when compared to mountains, I made my way down and clocked Nelson’s monument. At this moment in time I had no idea what it was, but remembered seeing it from Edinburgh’s main shopping area last time. And so the hunt for the path to the top began. Steadily making my way back up and onto the top, where a series of monuments stood proudly, as the sun rose in the background. But before long, it was time to head back to the hotel, to breakfast and ultimately to work. I showed myself that you can have a great mini adventure, even when your schedule is busy and your time is limited. Simply put, you have to make time and take the opportunities you can create. The running wasn’t hard or challenging, but the act of running, experiencing and doing more than simply sleep, work and eat made the trip that bit better. If you’d like to see more day to day running, riding and general life, follow me on instragram & if you don’t already, subscribe to the website.